One of the most enduring memories I have of my late mother, Sandra, is the appreciation and enthusiasm, she always had for this time of year...October...when the leaves turn color and the seasons change. Her and my dad would celebrate their wedding anniversary and travel to a place in Indiana, often for a weekend and sometimes a week, to enjoy being together. And, not unlike the radiant colors that are revealed in the leaves, my mom&apos;s expression would light up whenever she described the experience to a friend or member of our family. You can experience that same kind of beauty, awe and peacefulness right here in Hendricks County. Before I get to my recommendations one general tip is either starting your adventure just before sunrise or extending it to roughly an hour before sunset when the colors are most vibrant and the sky tends to provide a scenic backdrop. You and your camera won&apos;t be disappointed and it&apos;s a great way to get rid of a little stress. But here&apos;s the best part. All of the places I&apos;m about to highlight to see the best fall foilage are all free. So, with that in mind, here&apos;s a few places you&apos;ll want to visit. 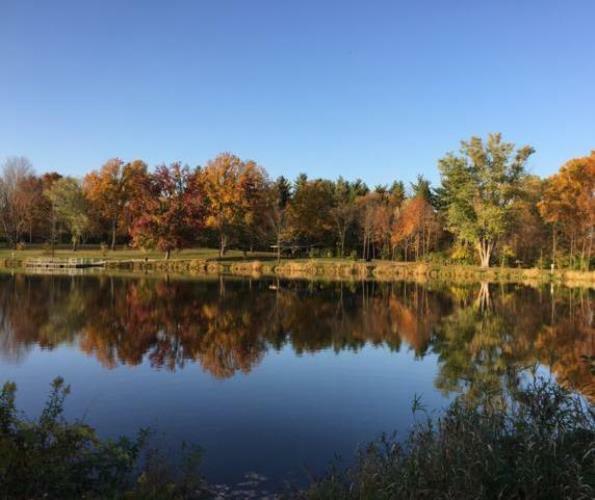 Recognized as one of the best places in all of Indiana to see fall foliage, McCloud Nature Park in North Salem features acres and acres of wooded settings, an array of different types of trees and plenty of trails through which to see it all. Worth the trip, too, is the beauty of Sodalis Nature Park in Plainfield. Among its vast woodlands resides the park&apos;s namesake (...an endangered bat) and it features lots of trails and even a fishing pond. Talk about relaxing. If you&apos;re headed to or planning to visit Danville, you can stop and enjoy a visit to either Blanton Woods, Ellis Park or both. With land donated more than 20 years ago, Blanton Woods is a perfect illustration of what it means to offer a truly "untouched" and genuinely scenic environment. By contrast, Ellis Park is a great place to enjoy a variety of recreational activities while surrounded by tall trees and lots and lots of leaves. The best part is a rustic trail on the north end of Ellis Park links the two areas. In Brownsburg, you have a choice of two beautiful parks - Arbuckle Acres Park and Williams Park -- or you can hit the rails, as in the B&O Trail. 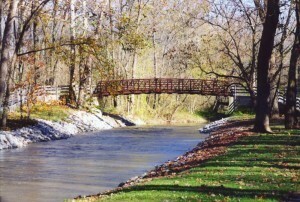 Living in Brownsburg, Arbuckle Park is among my favorite places to get away and relax. It&apos;s close by, yet it&apos;s remarkably &apos;quiet&apos; when you&apos;re walking through the wooded area that&apos;s down a huge hill from the ball diamonds, tennis/basketball courts and playground areas that occupies the rest of the public park. Likewise, in Avon, you can discover even more leaves along some of the trails located near Town Hall Park or Washington Township Park. Finally, you can never go wrong with a visit to Plainfield&apos;s Trail System, and fall is no different. Their system includes another rail trail the Vandalia Trail, which is even more beautiful if you connect with it between the tiny towns of Amo and Coatesville in the western portion of the county. Unlike Plainfield, where the Vandalia is paved. The section between Amo and Coatesville is rustic, beautiful and even includes an adjoining equestrian trail for those with horses.